Anne surveys some of the wonderful gift items at the Holiday Shops at Bank of America Winter Village. With sustainable sources, these are good for the earth as well as your recipients! This year the Holiday Shops have several Eco-friendly shops full of environmentally friendly gifts, making it easy to give green this year. Specializing in urban and alternative gardening, Brooklyn Botanicals stocks an impressive variety of easy to care for air plants (Tillansias) and terrariums. Mounted on a wall or hung from the ceiling, these make great gifts for plant lovers short on space. 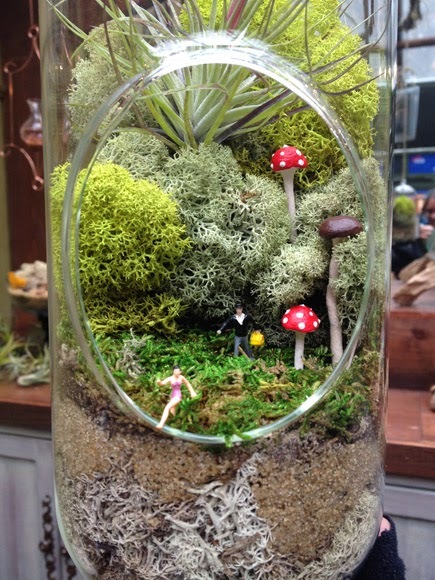 Large (left) and small (right) terrariums brighten any home or office. A bag of beans is a reliable gift for dedicated coffee drinkers, the host of the next party or dinner you attend, or for that person (or persons) in your office who drink all the coffee but never make a fresh pot. (Every office has at least one.) Try the organic, fair-trade, micro-roasted coffee at Buunni Coffee. While at the Buunni kiosk, I was given a sample of the dark Harrar blend (not pictured below, but in stock) and it was seriously some of the best coffee I've ever had. It's sold in full and half pound bags, and they will grind it for you if you like. Cliff Belts has a great selection of unisex accessories made from cork, including belts, card holders, and billfolds. They are well designed, beautiful, and sturdy. Perfect accessory options for the vegans in your life. Perhaps my favorite items in the store were these belts made of distressed canvas and finished in cork. The belt's rings are made from the poles of decommissioned NYC subway trains. And nothing says sustainable like ditching that plastic water bottle and replacing it with a tempered glass version from Glassery. More on Glassery here on the blog. Congratulations! This is the best factor, Thank you so much for trying to talk about this exciting information.